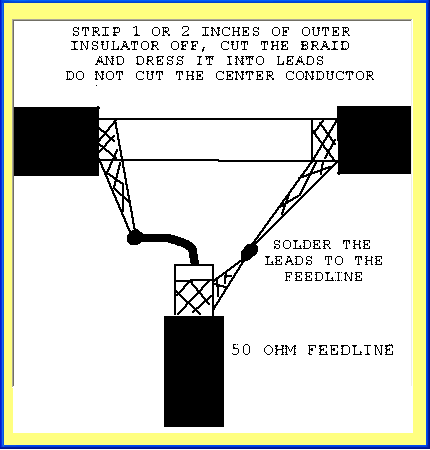 Many would be familiar with the traditional folded dipole made from tubing or wire, and possibly the lightweight version made from 300 ohm ribbon cable. The above versions need some sort of matching to enable use at 50 ohms. Awkward you say? I would agree! What if I told you can make a 50 ohm version directly from RG-58 or RG-8 / RG-213 cable? 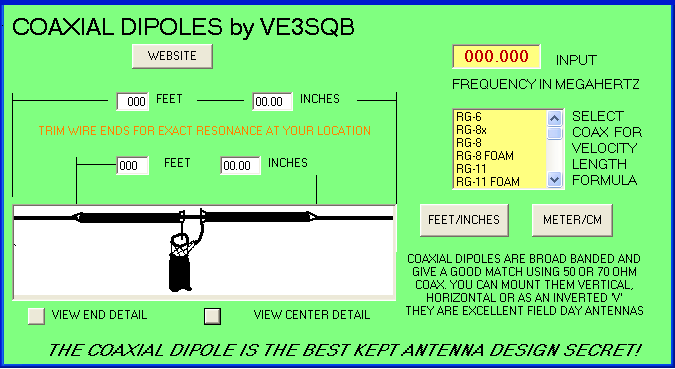 Go to http://www.ve3sqb.com/ and look for the icon labelled "Coaxial Dipole", and download to a suitable sub-directory on your PC. It’s ready to run. 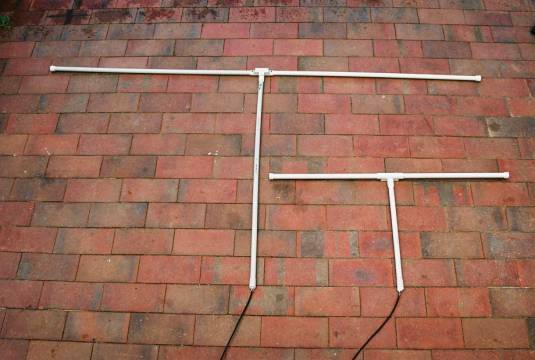 All the basic construction details are included, and you can design an antenna for any frequency. As stated in the application, the design is reasonably wideband (a trick here, make the element from RG-8 / 213 for wider bandwidth). 80 MHz - This is for a WICEN commercial allocation. 2 Metres - This one covers 144 – 157 MHz and as well as 2 m can be used for Marine VHF (WICEN has a licence for a Limited Coast Station). VHF Highband (156 – 165 MHz) - This one covers VHF Marine and a WICEN commercial allocation. 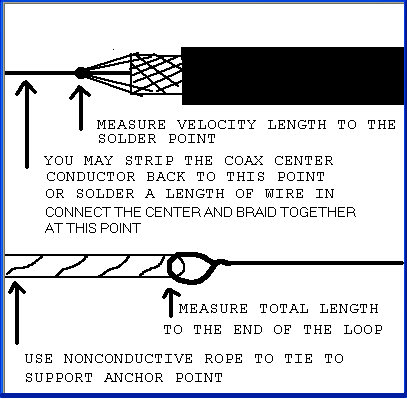 Input a frequency (choose a centre frequency for your desired band), and the type of coax you will be using. This determines the velocity factor for the calculation. Then select “meter/cm” or “feet/inches” as you desire. This will give you the dimensions for your driven element. From the main view you can select “view end detail” and “view center detail”. Make the wire ends about 10 mm longer than calculated, and tune the antenna by cutting a couple of mm at a time. Use a VSWR meter to check the desired band edges and centre frequency as you tune. You will need to hold the antenna well above ground when checking VSWR. Use any suitable non-conductive material as a temporary former. Once you are happy with the tuning you can permanently house it. (Tip – if you cut it a bit short you can solder extra wire on). 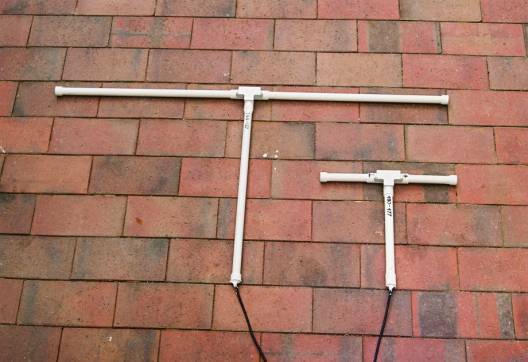 For VHF and UHF, you can mount the antenna in a housing and then clamp it to a mast rather than using rope or something similar to elevate it. I used some 20 mm conduit, a matching T-piece (the type with the inspection plate so you can join the element to the feeder) and end caps to make a housing for the dipole. A standard right-angle clamp will get your antenna latched onto your mast. Note: I found that the 20 mm conduit was not heavy enough to support the 70 MHz antenna vertically (the cross arm sags a little) so I would recommend 25 mm conduit, but I haven’t tried this yet. Below are my plots of the Return Loss / Bandwidth of the four antennas. The plots were taken on an IFR COM-120B Test Set with a Return Loss Bridge. The antennas were mounted at the top of a 6 metre metal mast, and each antenna was placed respectively ¼ wave away from the mast. The coax feeder was 8 metres of RG-213. Return Loss is just another way of measuring the reflected power of a load. RL is measured in this instance in – dBm. 0 dBm RL is “infinite” VSWR (in fact a short or open cct). An VSWR of 1.01:1 would give Here is a ready reference of RL / VSWR.